Texas attorney and alcoholic Katie Connell’s career just melted down before her eyes. After very public failure during a doomed celebrity trial and a heart-wrenching breakup, she avoids rehab by retreating to the tropical island where her parents tragically died. But when she arrives, it becomes obvious that her parents’ supposed accident was cold and calculated… As Katie sorts through the clues, she gets help from an unexpected source: a spirited house named Annalise. Between the kindred ghost, a local singing sensation, and a handsome chef, the quirks of the island throw the former attorney for a major loop. Can Katie pick up the pieces of her life and solve her parents’ murder as part of her fresh new start? Saving Grace is a hilarious romantic mystery. 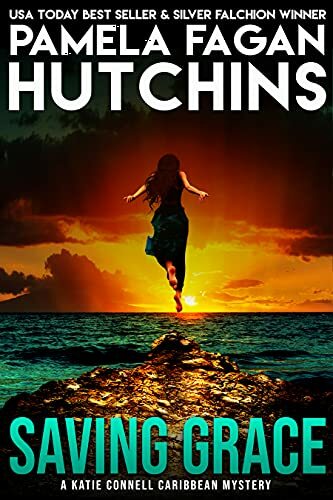 If you like island getaways, compelling characters, and witty dialogue, then you’ll love USA Best Seller Pamela Fagan Hutchins’ suspenseful story of voodoo and redemption. Click here or type in http://geni.us/savinggrace into your web browser to pick up your copy of Saving Grace in the Amazon Kindle store. I like big butts and I cannot lie: horse butts that is. As in draft cross horses, which I ride with my hunky husband way up in the frozen north of Snowheresville, WY and deep in the heart of Nowheresville, TX. I am a wannabe barrel racer afraid of going fast, an eater of ribeye, and the author of the USA Today bestselling What Doesn’t Kill You world of romantic mysteries. When I’m not writing or riding, I’m passionate about hiking, always with a couple of rescue dogs (and an occasional goat and donkey), bear spray, a mountain lion knife, and my Judge. 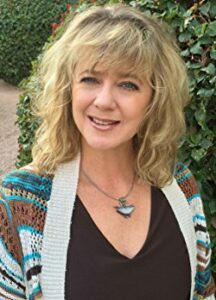 You can visit Pamela’s Amazon author page if you click here or type in http://geni.us/pamelafh into your web browser.